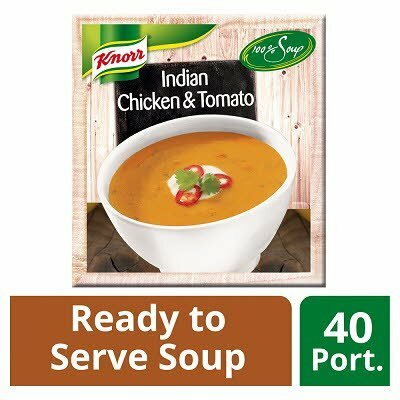 Try Indian Chicken & Tomato from our Knorr 100% soup range with authentic flavours. Water, tomato (30%)**, rapeseed oil, chicken (3.1%), tomato paste (3.1%)**, coconut, lentils, skimmed MILK powder, modified corn starch, flavourings (contain CELERY), salt, potassium chloride, coriander, yeast extract (contains BARLEY), spices (paprika, white pepper), concentrated lime juice, balsamic vinegar powder (wine vinegar, grape must), white wine extract, maltodextrin, fructose, stabilisers (sodium triphosphates, sodium polyphosphate). May contain: egg, mustard. **made from sustainably grown tomatoes. Store in a cool dry place. Once opened refrigerate any unused product and keep for max. 72 hours at max. 7°C. - If pouches remain unopened after heating, they can be cooled down to < 10°C (following HACCP rules) and reheated to above > 75°C for use within 24 hours.